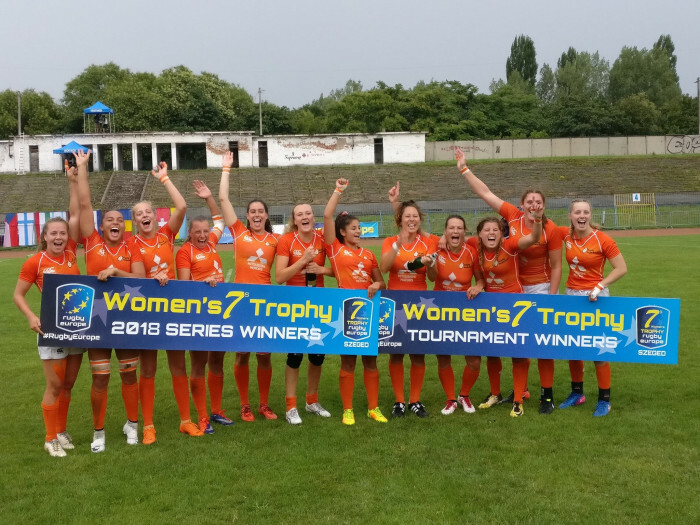 The Netherlands and Ukraine will be back at the top level of European Sevens next year after repeating their 1-2 first leg finish in the second leg in Szeged in Hungary. An exciting new Dutch team will be in the European Grand Prix next year after dominating the Trophy second leg even more than they did the first. 156 unanswered points on the first day set up a second day that saw a big 57-5 quarter-final win over Hungary (which effectively ensured promotion) and a commanding semi-final win against Sweden before the final against Ukraine. When the semi-final round began any of the participants had a mathematical chance of being promoted with the Dutch, but the Ukraine’s massive 50-5 win over the mercurial Romanians ended both their and Sweden’s hopes. Romania had again provided the highlight of the first day. After beating Ukraine in the pool in the first leg they added Sweden’s scalp with an exciting 12-10 win that meant they won Pool C, which gave them that chance of promotion. The other standout result on the opening day was Israel’s unexpected 5-0 win over Finland. In practice this did not immediately change much as the Israelis has lost their opening games heavily so they were still in the Challenge on Day 2, battling to avoid relegation, but the win turned around how the team approached the second day. Latvia – last in the first leg - were also in the Challenge, which ensured they would go down, but the second relegation spot was between Israel (11th in the first leg) and Austria (10th). Their points difference record (the decider if tournament points were equal) was all but identical, so a good Israel win in their Challenge semi-final was crucial. Buoyed up by their win over the Finns they achieved this by 24-5 – that 19 point margin putting Israel in the driving seat. Austria could still battle back with a big win against Latvia in the 11th place match – but they could only win by 19-17. Israel just need to avoid a 37-point defeat in the Challenge final against Switzerland… which they did, losing only 24-5. As a result, they missed relegation by the skin of their teeth… again. And so to the final. With everything already decided (even the overall title as the Netherland’s massive points difference advantage meant they had already won the title) the final could have been a little flat, but it proved to be an exciting climax, with Ukraine overturning an early Dutch lead to lead 12-5. The Dutch battled back, however, drew level before scoring the winner from the final play.